A sweet reader reached out to me asking how I always manage to look so pulled together as a busy Mom of two. Truth is, I’m not always as put together as I appear to be here and on the little squares you see on my Instagram feed. BUT I do make an effort with my wardrobe, because honestly, it just makes me feel better. I know that not all of you that read my blog are Moms, but please don’t let that deter you from reading todays post! It’s a post for everyone, just with a catchy title for google. I also want to say that if you are in the brand new season of motherhood, where just getting out of bed and knocking out a load of laundry is all you can muster, thats totally ok. This post probably isn’t for you- it may be in the future- but right now, get your rest and enjoy all the baby snuggles. How to Master Mom Style. A few things that I have noticed over time; first, I just feel better and more productive when I’ve taken the time to get ready. Yes, there will be days that I’m make up free in my favorite lululemon leggings and a cozy cardigan and still knock my to do list out, but I have noticed I’m less inspired and less creative. The second thing I’ve found, It takes just as much time to pull on a pair of jeans, as it does leggings. Just as much time to throw on a cute top, than it does my husband oversized tee. I make every effort to do a light 5 minute makeup routine in the mornings while the kiddos eat breakfast. Concealer, bronzer, blush, mascara, and brows. A little mascara can change your day. I promise. The last thing I’ve noticed, accessorize. 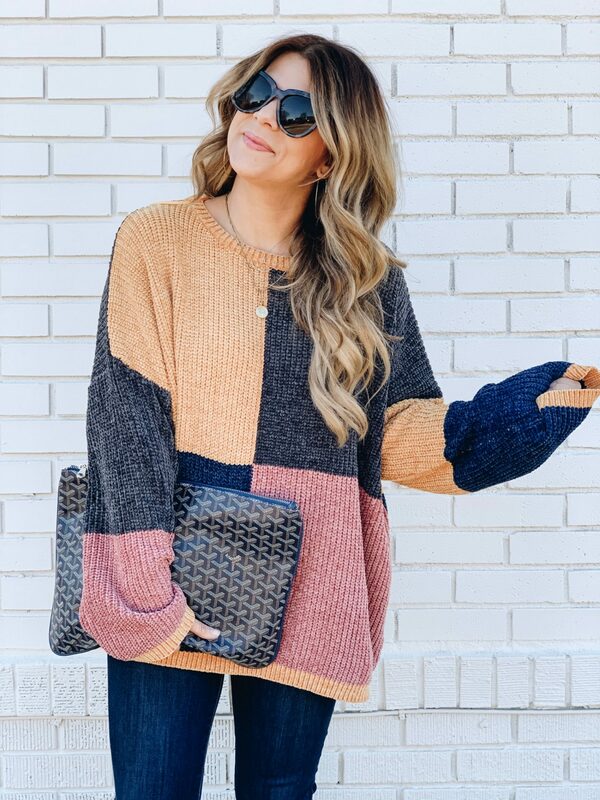 Whether its adding a great bag, a statement piece of jewelry or a scarf, just something that adds a little extra something to your look can go a long way. My biggest style tip for you is to invest in a couple pair of comfortable, no fuss jeans. I would start with a mid-rise, dark wash that you can wear year round and dress up and down. For this season in particular, add a few sweaters and a great pair of boots to your wardrobe. 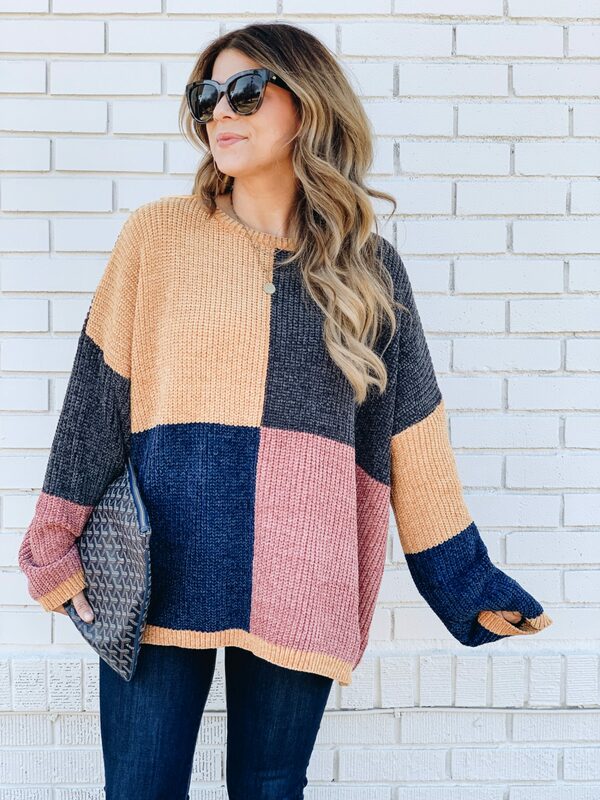 I love a good everyday cardigan that you can through over a great plain tee, a structured sweater that is classic and sophisticated and a could chunky, oversized sweaters like this one! We can find substitutes for each of these depending on the season. 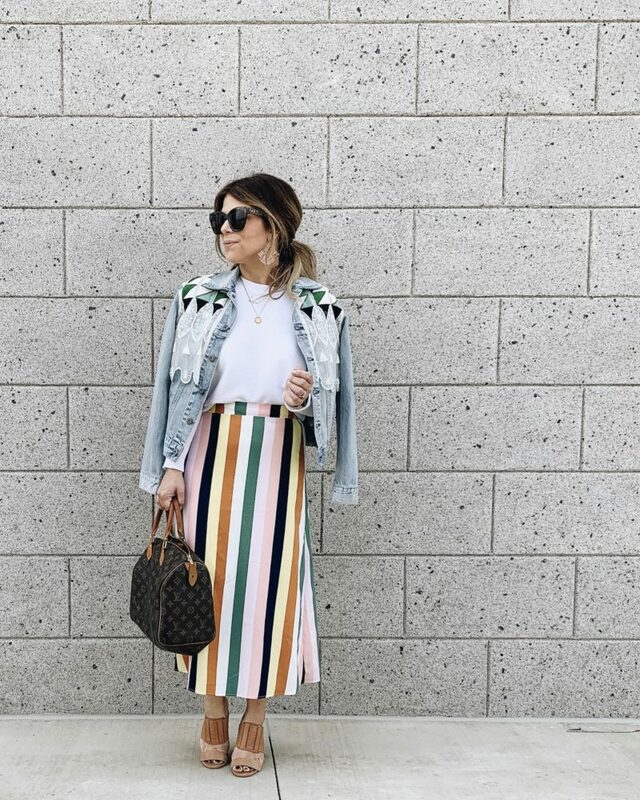 Switch your chunky sweaters out for lightweight ones for spring. Switch the cardigan for a long kimono for summer to pair with your basic tees and tanks. 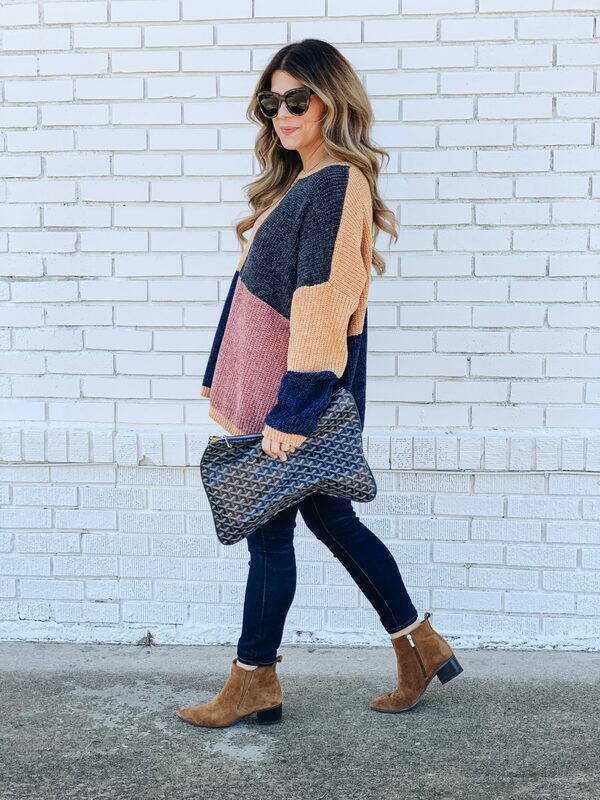 Switch out your classic sweaters for a good Chambray button up and printed blouses for Fall. Swap out your boots for mules or a chic white sneaker that you can wear with dresses and denim! I hope that you find this post helpful as you are getting dressed each morning. Give it a few days of reaching for your jeans instead of sweats and then let me know how you feel! I promise you will be more productive and will feel great! 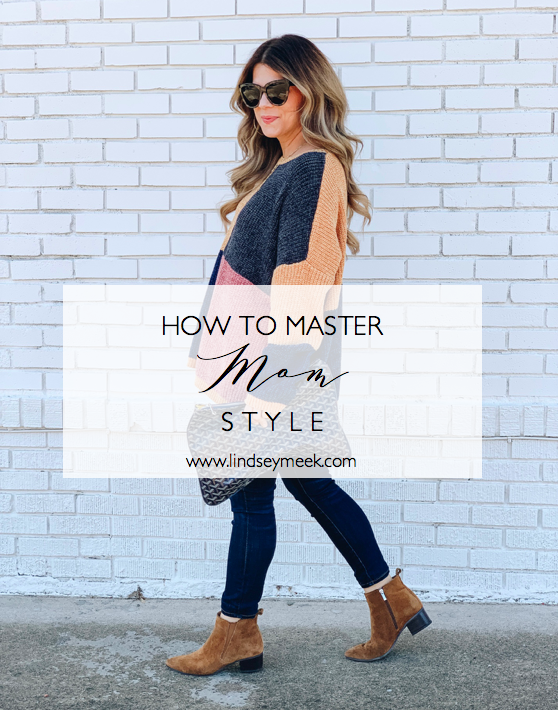 Do you have any other tips for Mastering Mom Style? If so, leave them below! You do always look great! I totally agree that a good pair of jeans and stylish but cool flats/boots are the basics of all my mom looks.